Composed by Mikael Carlsson. Christian, Christmas, Easter. 8 pages. Published by Carlssons Kluster (S0.343707). 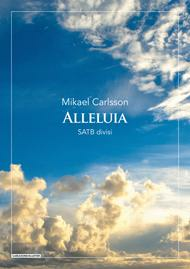 A colorful, exuberant and dramatic setting of the multi-faceted 'Alleluia' for mixed choir a cappella with divisi. This piece was commissioned as a joint venture by Caritas Chamber Choir in Canterbury, UK, and Haga Motettkör of Göteborg, Sweden, and premiered in concert during Haga Motettkör's 2016 UK tour "Northern Lights". Audiences love the effect created at the middle of the composition - a long and overtone-rich glissando which is resolved in a triumphant theme! Choral score, 8 pages. Duration: 6:00. Suitable for sacred use in service or concert on Easter, Christmas, wedding, and for general worship or as a choral postlude. Also great for concert programs concerning themes such as faith, spirituality and love. Discover more music by Mikael Carlsson at http://www.mikaelcarlsson.com .